Basil Lanneau Gildersleeve, Johns Hopkins’ first professor of Greek, was born in 1831 in Charleston, South Carolina, and was orphaned at a young age. Gildersleeve proved to be a precocious child who displayed a hunger for classical learning. His determination took him first to the College of Charleston, then to Jefferson College in Pennsylvania and on to Princeton, where he earned his bachelor’s degree at the age of 18. He then went to Europe for advanced study, earning his doctorate at Göttingen in 1853, at the age of 22. Returning to the United States, he became professor of Greek at the University of Virginia in 1856. When the Civil War began in 1861, many faculty members in the south resigned their positions to join the Confederate armies. Gildersleeve accepted a staff officer position in the summer of 1861, and he returned to the army each spring at the conclusion of classes. During a skirmish in the Shenandoah Valley in September 1864, Gildersleeve was delivering orders to the front when gunfire shattered his leg. Gildersleeve’s comment summed up the incident: “I lost my pocket Homer, I lost my pistol, I lost one of my horses and, finally, I came very near losing my life.” As a result of this wound, he would bear a limp for the remainder of his life. During his convalescence, brooding over the prospect of a postwar South dominated by the North, Gildersleeve considered abandoning the academic life and joining the conflict in Mexico with Maximilian. Overcoming his despair, Gildersleeve returned to Charlottesville and resumed his duties, helping to rebuild an institution ravaged by war. In later life, he reflected, “At the University of Virginia, I learned what scholarship and toil meant in terms of growth and inner rewards.” Students came to cherish the rigorous training they received at the hands of this Greek master. A brilliant scholar, Gildersleeve was known to be very demanding of his students, singling out with biting comments those he felt were performing below their abilities. As he matured, his classroom demeanor softened. After failing to persuade a Harvard scholar to relocate to the new Johns Hopkins University, Hopkins president Daniel Coit Gilman was directed to Gildersleeve. Gilman tendered an offer to Gildersleeve that the latter accepted in December 1875. 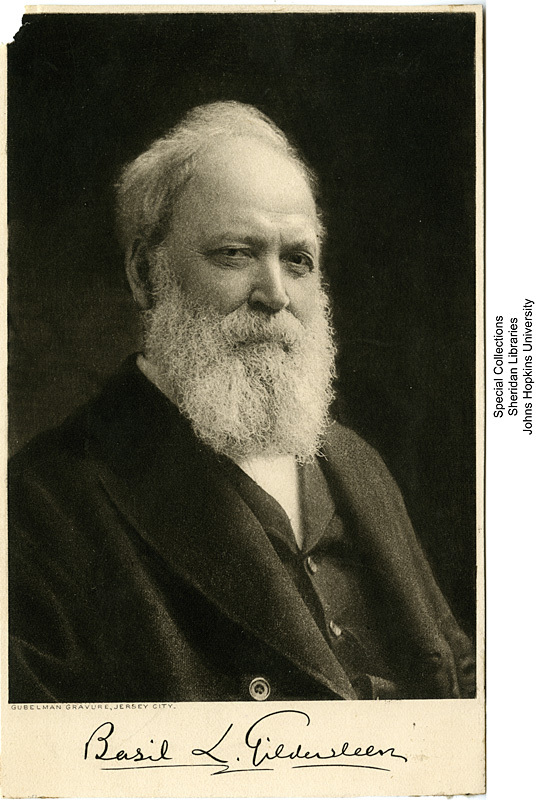 Gildersleeve’s hiring helped allay the fears of many who nervously watched Gilman, from Connecticut, build a university with a bequest from a pro-Union railroad baron. Their fear was that the new university would employ only those sympathetic to the North. Gildersleeve retired from teaching in 1915, after a professorial career spanning nearly 60 years, and passed away quietly on January 9, 1924.